In our part of the world summer vacation is the most important one for most people. There are several reasons for this and probably the major one is that during July and August in this part of western Balkans, where we live, temperatures can go as high as 45C (113F) degrees and the obvious solution is to pack your bags, jump into the car and go to one of four nearby seas for couple of weeks to cool and enjoy (and also to change the everyday scenery and recharge your inner batteries which are always seriously depleted when summer come). When we visited our travel agency (Big Star Niš) and told them that we decided to go to Parga this year, Stefan, one of the agency owners, while describing the house we wanted to hire said something about nearby olive forest that looks exactly like the scenery from "The Lord of the Rings", fantasy trilogy based by J. R. R. Tolkien famous book. Of course, I was little skeptical about this but in the same time very curious to explore. The moment of our arrival, when I saw first large olive tree just above our villa I was eager to go to the forest as soon as possible. So we did very next day and if you look next couple of photos from the woods when we made a shortcut our way to the Lichnos beach I am sure that, like me, you will agree that old olive trees are something special to see and to tell you the truth if Bilbo Baggins or Gandalf jumped out of some tree I wouldn't be surprised at all. My only regret is that we didn't hit the time when olives are being collected with large nets villagers are using for this purpose. I am sure this would be something worthwhile to see. Needless to say, our landlady on our last day gave us a bottle of olive oil as a present, made exactly from the olives collected right from the woods we saw and photographed and with this blog post I thank her for all her hospitality and kindness. The same level of gratitude goes to Stefan and "Big Star" which is one of the best travel agencies in Niš. According to couple of wikis I read, I learned that Pargians are descendants from the old Greek tribe called Thesprotians. Perhaps the best known resident in the ancient times was Odysseus himself who married Thesprotia's queen of the time by the name Kallidike and spent many years in this area leading the tribe and fought many wars as their king. Unfortunately, if we leave mythology aside, real history for Pargians was not so cheerful especially much later in the dark ages when these people shared violent times with the active neighborhood. They survived different rulers and occupations starting with Normans, Venetians, French, British, Ottomans, not to mention constant attacks from various pirates from the sea. Today, monumental fortress built for their defense is the sour witness of the old times standing above the small town for centuries. In the town bellow, old stone narrow streets, similar to those of Corfu are now wonderful tourist attraction along with four beaches, all very different in nature and appearance. Surrounded with large hills and dense forests, Parga today is one of few real tourist paradise during summer filled with voices of dozen of different languages especially at night when it is not easy to find empty chair in local tavernas. In addition to Parga's social life, to me, Greek vacations are always more about reading books and enjoying peaceful moments. This time I brought "The Lost Symbol" and swallowed it in just couples of days. If you want to learn something more about worldwide freemasonry this is the book for you, especially if you are, like me, big fan of Robert Langdon's adventures. We had large garden in front of the house with big stone table where bellow the shadows of lemon's leaves, reading Dan Brown's book got additional pleasure. At the other hand, for Viktor no summer vacation can pass without his tablet and couple of video games (picture to the right). 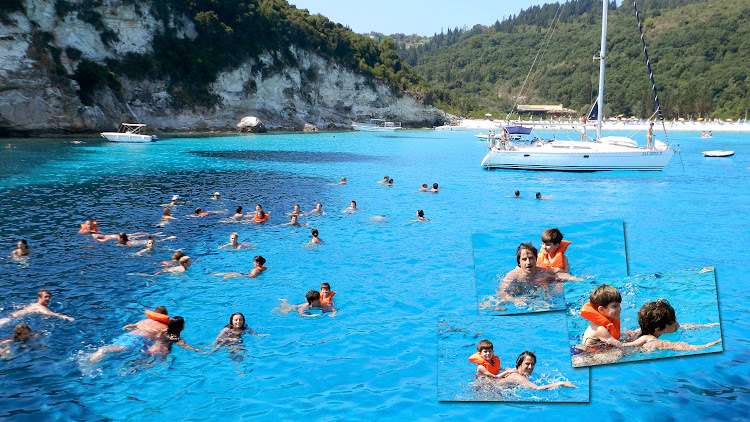 Just 20km offshore there are two small islands called Paxos and Antipaxos. According to the legend, Poseidon himself used his mighty trident and sliced the southern part of Corfu making these small archipelago paradise just for him and his wife Amphitrite to enjoy some peace and quiet. Comparing to nowadays worldwide religions I really love Greek mythology and their amazing stories. I mean, come on, if you are creating a mass fairy tales using wild imagination is a must and ancient Greeks did it very well. In all religions in existence today and those extinguished in the past, Greek former beliefs are probably the best in the history of mankind. Anyway, there are many boats sailing to Paxoi islands every morning providing one of the kind experience of swimming the same waters where Poseidon enjoyed his time with his wife alone on the beach. Small boat even entered one of the sea caves providing the unique feeling for us, but the best was the moment when one of the boats turned loudspeakers toward the cave and played James Brown's "I feel good" famous song. The echo from the cave provided a sound effect I never heard before. Don't miss this trip if you are spending vacation in Parga or Gaios, the main town of Paxos island where we enjoyed "Τσιπούρα", delicious Mediterranean fish with teeth. Second boat trip was ship cruise to Corfu and island of Vido (Greek: Βίδο), special place for Serbian history where more than 5000 Serbian soldiers were buried at sea. At the beginning of the World War I, the whole Serbian army was forced to retreat by the major offensive by Austrian and Bulgarian armies. In just two years of war Serbian army declined from 420.000 to the number of 150.000 ending to the island of Corfu with the help of Allied forces' ships. Those who didn't survive harsh winter time during long walk over Albanian's mountains were buried on island of Vido and those who couldn't find empty burial space on the island are just buried in the sea near the island. This very spot where they are buried are called Blue Sea Tomb and there is now almost hundred years old poem "Ode to a Blue Sea Tomb" describing the pain and suffering of the Serbian people and soldiers during the WWI. I simply wrote "History is sometimes painful" to the book in the memorial. And I meant not only Serbian history. More about our trip to Corfu please read in the post Streets of Corfu where I experienced unique kind of Déjà vu I tried to describe there. Following are photos from Corfu and Vido and second image is Serbian House in the street of Moustoxidou 19 which is one great museum dedicated to the WWI events. But, life is always going on and history is there to remind us for our failures and our brightest moments. We should use it to learn from it but honestly speaking I have that feeling that humans have long way to go in order to start avoiding mistakes and stop repeating violent behavior from the past. Well, this post is also a photo collection from the vacation and now is the time to choose the best photo taken. Of course this is subjective business but if you ask me the honor goes to my wife Cica who took the opening photo of this post. I am sure for some of you this would be just bunch of rocks on the shore but for me this is the perfect example of accidental photography and Pareidolia. My wife actually just wanted to take a photo of the rocky formation from the taxi boat when we were returning from the beach to Parga, but after we saw it on the big screen, from this angle, it looks amazingly like a giant prehistoric fish or sea dinosaur with large fin or flapper on its back. Needless to say that we all fully recommend Parga and Ionian sea for summer vacation. I am sure we will be returning here in the future maybe next time on the northern Corfu or one of the southern Ionian islands.